Waterfall Farm Christmas Market on Saturday 13th December from 10am to 4pm. Sheep Herding & Duck Herding – Talented shepherd Donie Anderson and his clever dogs will be herding sheep and they will also be herding ducks. Demonstrations will be given throughout the day. For the kids? – Santa Claus, sheep & duck herding demonstrations, storytelling, visit the farm animals, face-painting and the Children’s Art Corner! There will also be hot food available and tea and coffee. The Christmas Market is indoors in our cosy Market Barn and our Combine Shed but we do advise to dress for the weather and bring the wellies! The Christmas Market runs from 10am to 4pm. Entry and Parking are free. 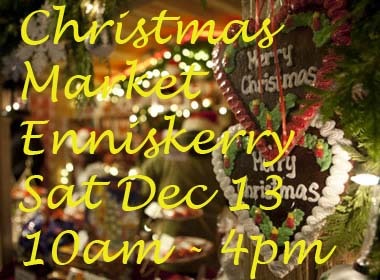 The charming Waterfall Farm, located outside Enniskerry in the distinctly beautiful Glencree valley, are hosting their increasing popular Christmas Market. Each child receiving a small gift and reindeer food. Local shepherd Donie Anderson is sure to enthral and delight everyone with his demonstrations of sheep herding and duck herding with his talented Wicklow collie Jess! Enjoy browsing the many food and craft stalls that are bursting with Christmas cheer in the cosy Market Barn and Combine Shed. Finding that perfect and unique gift is child’s play with craft stalls boasting items such as hand-turned wooden bowls, handmade pottery and ingenious metalwork gifts made from horseshoes. Foodie enthusiasts will delight in the Irish owned Olive Oil, Wicklow honey and the extremely more-ish handmade cakes and puddings. While Christmas decorations, skin care products, children’s clothing and textiles are sure to catch the eye. Children will be captivated by Tallulah the pet sheep and her friends and can enjoy storytelling, face-painting and hours of fun in the Children’s Arts Corner.